My friend Kim has sent me this recipe for Coriander Pesto which is a good heavy metal detox. One of the ingredients in this recipe is dulse. Living in a little village, we don’t even have a health shop let alone a specialty food store. So, I headed to town (read Somerset West) and not one of the three health shops I went to keeps dulse. Dulse is a red alga. Not only is it a good source of vitamins and minerals, it also contains trace elements and is a good source of protein. For people on a vegan diet, this would be essential. This pesto is really amazing in both taste and texture. As it is a heavy metal detox, Kim recommends that you only eat a couple of teaspoons a day. It freezes well so make it when coriander is in season and you will be able to enjoy this pesto all year round. Yum! definitely my kind of pesto! I usually make it with cashew nuts, and will surely try your version with seeds! Love this recipe Tandy! I would love it with poached chicken and rice. Coriander rules. I love coriander and making a pesto with it sounds wonderful. I’ll leave the dulse out as I know I’ll never find it. It is going to be hard enough finding brazil nuts. O nooooooo!! I am dying!! 🙂 I cannot understand how anyone can get fresh corainder over their lips!! the dishes were a gift from a friend – I have two from her and this week will have to get myself another 2! Oh my, I have to go in search of dulse! Looks gorgeous. Like a lot of people have never heard of Dulse. Shame my coriander died off…maybe I´ll try planting some of the seeds I saved. 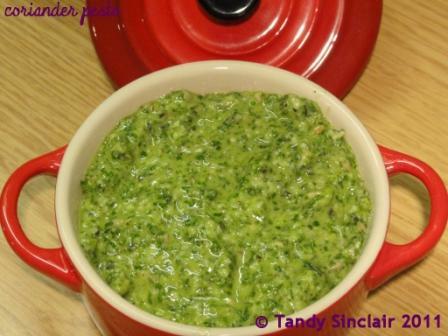 Delicious idea – I’ve never thought of using coriander in pesto. Nice post. Never even heard of dulse before – will keep an eye out for it and with coriander being my favourite herb, I will definitely be making this lovely pesto. Tandy, I’ve never used dulse before, but I have seen it on sale and not known what it was. Thank you for the headsup and the great recipe!